As World Rhino Day 2015 approaches (22 September), with no respite in the decimation of South Africa’s rhinos by poaching syndicates supplying the ongoing demand for rhino horn, five Youth Rhino Ambassadors have been selected to represent South Africa and carry an important appeal to Vietnamese citizens and Asian government leaders to urgently bring an end to the rhino poaching crisis. This is the first time South African youth have been invited to visit Vietnam – internationally recognized as a key consumer country and hub for the sale of rhino horn - and participate in a government-led demand reduction campaign. They will be guests of Operation Game Change, a joint Vietnam/US government initiative aimed at ending wildlife crime in Vietnam, especially rhino horn trafficking. Selected for their leadership, activism against rhino poaching and participation in the 2014 and 2015 World Youth Rhino Summits, they will present the World Youth Wildlife Declaration to Asian government representatives and engage directly with Vietnamese youth and leaders during their week-long visit at the end of October, speaking about their personal experiences of the rhino poaching crisis in South Africa. Operation Game Change (OGC) has high-level support from Vietnam’s important Ministries of Natural Resources and Environment and Agriculture and Rural Development, with support from the US State Department and US Embassy in Vietnam. Managed by the Freeland Foundation, the campaign seeks to increase awareness, change behaviour, and catalyse action through a series of events and activities leading up to WildFest - a live, high-profile, public event designed to engage, entertain, and influence public debate in Vietnam around illegal wildlife trade issues. Alongside the South African youth delegation, government representatives from Vietnam and other Asian countries, celebrities, business leaders, NGO partners, and media will attend WildFest to show their joint commitment to ending the illegal wildlife trade. The World Youth Wildlife Declaration is a world-wide call to action from young people against rhino poaching and all other forms of wildlife crime. It was launched on World Rhino Day last year at the inaugural World Youth Rhino Summit, which took place in Hluhluwe-iMfolozi Park and brought youth leaders from 20 nations together - including Vietnam - to debate, discuss and learn about the rhino poaching crisis. “We, the Youth, are deeply disturbed by the worsening rhino poaching crisis, the exploitation of our natural heritage by organized criminal syndicates, and the subversion of our communities – all fed by human greed and deep-rooted corruption. We demand that our voices be heard! The World Youth Wildlife Declaration has spent the last 12 months travelling South Africa and other countries, collecting thousands of signatures and messages against rhino poaching from concerned citizens ranging from rural school children to global leaders. Notable signatories include Archbishop Desmond Tutu, Dr Jane Goodall, the late Dr Ian Player, African humanitarian adventurer Kingsley Holgate, representatives from the South African Department of Environmental Affairs, private and state rhino owners and US government officials. It is currently taking part in the iSimangaliso Wetland Park’s ‘My Rhino, Our Future’ Rhino March involving over 70 schools surrounding this World Heritage Site. KwaZulu-Natal’s provincial and private game reserves are being hard-hit by rhino poaching and iSimangaliso, which covers 332 000ha of the province is no exception. The Declaration will collect further signatures and messages at the 2015 World Rhino Day event being organized by the Department of Environmental Affairs and iSimangaliso Wetland Park. Thereafter it will travel to the USA and Canada, before heading for Vietnam. 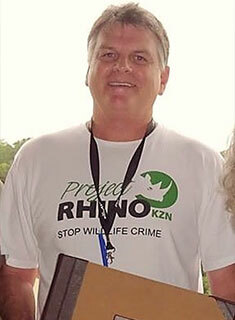 “When the rhino poaching crisis started, I was in the dark because I did not follow the life of our wildlife. But my eyes were opened when I was invited to the 2014 World Youth Rhino Summit. From that day, my heart was bleeding and I was ready to be the voice of our wildlife. I felt strongly that I must speak out for them. 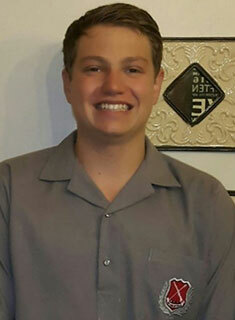 16-year old Jared Robinson is one of the 10 founding members of Maritzburg College’s ‘Rhino Warriors’ group that launched Project Rhino KZN’s #RhinoShoutOutChallenge online media campaign. He is responsible for the school’s rhino awareness social media and procuring sponsorships for their rhino-related fundraising efforts. Jared attended the 2015 World Youth Rhino Summit and has given presentations to several KZN schools and Rotary clubs on the rhino poaching crisis. “I believe that as Africans, we have a greater passion and understanding of this dire situation and I can continue along the trail blazed by the great Dr Ian Player. It is now our turn to fight and save the rhino and be a mouth-piece for these astonishingly beautiful and endangered animals who cannot speak for themselves. This is now an international struggle and it up to the youth to stand up to those who are doing nothing. 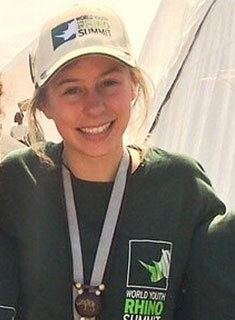 Emma is passionate and determined to make a difference in curbing the slaughter of rhinos in South Africa. Living in Graskop, which borders the Kruger National Park, she feels close to the crisis and in the direct path of intervention. 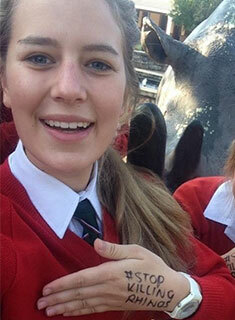 Emma helped launch the Rhino Art campaign at Uplands in 2013 and attended the 2014 World Youth Rhino Summit. Along with other pupils, she initiated the Uplands Rhino Project where Uplands students actively engage each year with 100 Grade 4s from Maqamela Primary school, a rural school close to the Kruger National Park. Every Grade 4 learner receives a copy of South African author Chris Daniel’s Bongi’s Quest and is helped to improve their English using conservation and African wildlife heritage as the focus. Emma has raised funds for WESSA’s rhino conservation efforts, been interviewed on radio by 5FM’s DJ Fresh and collected over 1,000 signatures in the World Youth Wildlife Declaration. She also attended a rhino poaching incident and assisted veterinary staff attend to bullet wounds in the badly injured rhino. Jacome is head of the Glenwood College Environment Committee and attended the 2014 World Youth Rhino Summit. Since then, she has been actively involved in calling for an end to rhino poaching by addressing other schools in the Western Cape, lecturing at the NMMU SciEx, participating in numerous rhino awareness drives and raising funds for rhino protection projects. Her leadership qualities have ensured she will be Head Girl of Glenwood House in 2016. “Those few days in iMfolozi Game Reserve at the 2014 World Youth Rhino Summit changed my life. On our return, we immediately started a Rhino Activation group at our school to raise funds for rhino anti-poaching needs. We also motivated three other schools to start their own rhino awareness groups and they too are now raising funds in support of organizations fighting to save South Africa’s rhinos. of previously poached rhinos and I promised myself that I would never allow them to disappear. 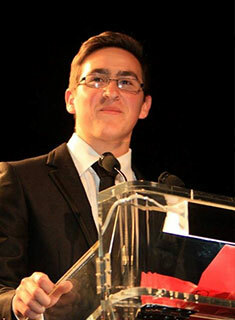 Latest Sightings, (www.latestsightings.com) was founded by Nadav Ossendryver at age 15 (now 19) and is an example of what a young South African entrepreneur can accomplish using 21st century technology. Channeling his passion for wildlife, conservation and his love of the Kruger National Park, he created an online, real-time, wildlife spotting community service for visitors to the Kruger. Latest Sightings combines social media such as Facebook, Twitter, WhatsApp, a website and iPhone, Windows and Android apps to inform visitors to the park (as well as enthusiasts worldwide) where interesting animals and birds have just been spotted. The Kruger Sightings YouTube Channel is the most watched South African based channel with over 230 million views worldwide and its Facebook page has over 133 thousand likes. Nadav has received numerous acknowledgements and awards including Social Media Star of 2014 award from Arthur Goldstuck, Nelson Mandela Youth Leadership Award 2014, the first LeadSA Youth Hero of the Month Award and is named in the 2015 Mail and Guardian’s Top 200 Young South Africans. He helped start the Rhino Art campaign in 2013, is an active partner in Project Rhino KZN’s #RhinoShoutOutChallenge online campaign and has collected hundreds of signatories in the World Youth Wildlife Declaration. Richard Mabanga is the Zulu cultural ambassador for the Rhino Art – Let the Children’s Voices be Heard campaign that to date, has reached over 200,000 youth with an impactful rhino conservation and anti-poaching message. Rhino Art – Let the Children’s Voices be Heard is considered to be the most successful youth-art conservation initiative ever undertaken, reaching beyond South Africa’s borders to Mozambique, other Southern African countries and also Vietnam. Its objective is to gather the largest number of Children’s Art Voices ever recorded in support of rhino conservation and to use these ‘hearts and minds’ messages from the youth as a worldwide call to action against rhino poaching. Richard leads energetic, Zulu culture-focused visits to schools in communities bordering game reserves targeted by rhino poaching syndicates in KwaZulu-Natal. 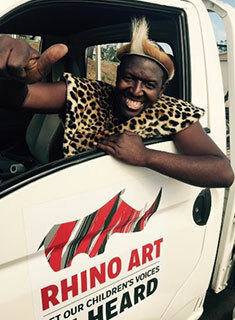 Dressed in traditional Zulu regalia, he educates pupils and teachers on the cultural significance of rhinos to African heritage and the negative socio-economic impact of rhino poaching. He dispels myths, raises awareness that rhino poaching is a Priority Crime in South Africa and helps to build bridges between game reserves and their community neighbours. Grant is well known in the KZN and Eastern Cape conservation communities. His family are part-owners of Amakhala Game Reserve in the Eastern Cape and his brother is the well-known wildlife Vet Dr William Fowlds. Having lived in KwaZulu-Natal for the past 15 years, Grant is deeply involved in Project Rhino KZN’s youth rhino awareness work and played a leading role in both the 2014 and 2015 Youth Rhino Summits. He has been involved in the Rhino Art campaign since its inception, is a committed conservationist, knowledgeable about the rhino poaching crisis in South Africa and a popular presenter, with a special gift of inspiring youth of all cultures to take action. The #LetOurVoicesBeHeard video will be launched on Project Rhino KZN’s social media platforms on World Rhino Day (Tuesday 22 September 2015), showcasing the growing global support of the youth generation against rhino poaching and wildlife crime. This short and powerful video produced by Earth Touch TV will accompany the South African Youth Rhino Ambassadors on their Operation Game Change visit to Vietnam.